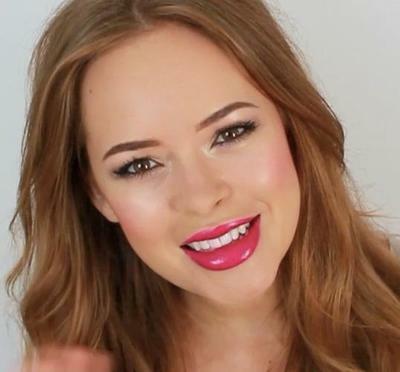 Tanya Burr is a British-based beauty guru and Fashion & Lifestyle Blogger and YouTuber. Since starting her channel over four years ago, Tanya has gained over a million followers with hundreds of thousands of viewers a day and over six million people a month. After leaving school, Tanya worked as a makeup artist for Laura Mercier and she trained with and assisted some of the UK’s top make up artists. Tanya now currently runs her own blog and successful YouTube channel posting make-up tutorials, fashion and hairstyle videos to her extremely large and international audience. She also films hauls and collaboration videos with other YouTubers as well as regular vlogs on her second channel which gives her viewers an insight into her life. She attends London Fashion Week each season, has been on the judging panel for ELLE beauty awards and writes for Grazia Magazine. Tanya also features in a new YouTube channel for beauty and makeover called DailyMix alongside other popular UK YouTubers managed by Gleam Digital. This year, Tanya has released her first ever line of lipglosses and nail varnishes, appropriately named Tanya Burr’s Lips and Nails on sites such as feelunique.com and Tanya has since announced the line will soon be available in selected Superdrug stores across the UK.